VOIP stands for Voice over Internet Protocol, in common terms voice connection using internet protocol through internet. In technical words VOIP is a technology used to transmit voice using broadband internet connection instead of old analog phone lines. There are many VOIP software are available in the market used to connect voice phone call and VOIP service providers offer their service with very low rates as compare to old Phone line service. Look for call center solutions that meets your specific requirements to operate your business. VOIP technique transfers voice data using Internet protocol, that is why first it convert voice data into digital signal to travel on internet. 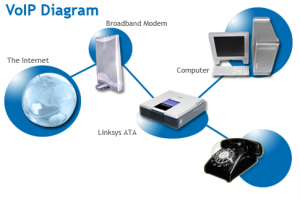 There is no special equipment used to make VOIP connection and this can be completed with a good internet speed connection like DSL and a cable modem. You can make local call and also long distance call using VOIP but all depends on your VOIP service provider. Use VoIP software to place international phone calls. * Its lower rate as compare to traditional phone line. When you are calling PC-TO-PC phone call then it can be even no cast but with low cast you can make call PC to traditional phone line any where in the world. Some VOIP providers allowing you to makes unlimited calls on monthly bases with fix chargers. This is best option for a company to increase their performance with minimum cost. * There any many features and services VOIP provider offers that are not available with a traditional phone line companies. There are a variety of devices that can take VoIP calls. Some aren’t even hardware at all, but software programs you can install on your computer.